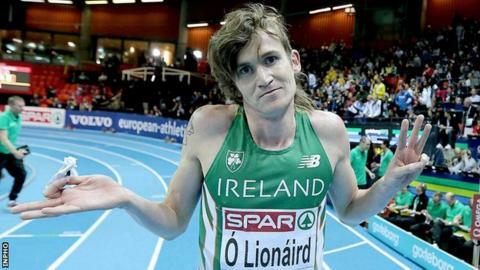 Irish athlete Ciaran O'Lionaird clinched a bronze medal at the European Indoor Championships but there was huge disappointment for Brian Gregan. O'Lionaird ran a brave race as he clocked a personal best of 7:50.40 in a 3,000m final won by Ethiopian-born Azerbaijan athlete Hayle Ibrahimov. Gregan was also a medal hope but was badly spiked midway through his 400m semi-final as he bowed out at halfway. The Dubliner's injury required 14 stitches after the race. The indoor 400m is invariably a rough-and-tumble race and Gregan was clipped at the key midway point by Ukrainian Volodymyr Burakov (47.03) who went on to qualify for Sunday's final after placing third in the semi-final won by the Czech Republic's Pavel Maslak (46.18) ahead of Britain's Nigel Levine (46.50). Gregan went into the championships as the fastest man in Europe following a 46.07 clocking in Athlone last month although Russian Pavel Trenikhin bettered that with a 46.00 clocking in Saturday's second semi-final. The Irishman's injury will inevitably mean a few weeks of missed training and he must now focus on getting himself fit for the summer track season. O'Lionaird stayed near the back of the pack over the opening half of the 3,000m final before taking closer order with the leaders. The Corkman surged into second place with 400m left but he was unable to get past gold medal favourite Ibrahimov who has clocked 7:39 for the distance this season. Fast-finishing Spaniard Juan Carlos Higuero also passed O'Lionaird in the closing 30 metres but the Irishman held off France's Yoann Kowal to take his first major medal. Amy Foster equalled her personal best as she progressed to the semi-finals of the 60 metres. The City of Lisburn athlete clocked 7.33 to finish fifth in her heat but it was enough to qualify a fastest loser for Sunday's semi-finals. Foster's time left her 13th fastest and she will be looking to chase Anna Boyle's Irish record of 7.30 on Sunday. Fionnuala Britton comfortably progressed to Sunday's 3,000m final. Britton clocked a time of 9:03.30 to finish third in her heat behind Portugal's Sara Moreira (9:01.00) and Britain's Lauren Howarth (9:03.30). The Irish woman was fourth fastest qualifier for the final with Russia's Natalya Aristarkhova winning the second heat in 9:02.61. Ciara Everard ran impressively to progress to Sunday's 800m as her third place in the second semi-final secured qualification. Everard's time of 2:03.40 was slower than produced by her team-mate Rose-Anne Galligan in the opening semi-final. However, Galligan's personal best of 2:02.84 was good enough only for fifth place and with no fastest losers, she exited from the Championships.